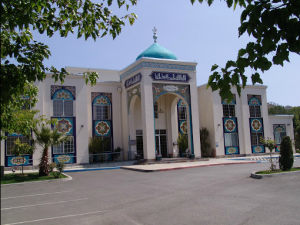 Masjid Abu Bakr Al-Siddiq is an Afghani mosque in Hayward, California. It is a smaller replica of the well-known â€œBlue Mosqueâ€ or â€œHerat Great Mosqueâ€ in Herat, Afghanistan. I drove into the parking lot for Friday prayers, and found a small market selling some eastern fruits and nuts, and a couple of older men dressed in black security uniforms. I was directed to speak with the President of the Mosque for my visit. He explained to me that the entire service was either in Farsi or Arabic. I was reminded of how hard it was to find a local mosque whose message was in English, and the value that Muslims put on Arabic as the language of God. This relative e antipathy for lesser languages may contribute to what seems like an insular Muslim sub-culture, in which concern for those outside of the language or culture is lower than concern for the purity of the faith, and desires for evangelizing non-Muslims may be trumped by the force of this language-centric faith. One of my first surprises was that I was the only person carrying a Quran. Coming from Evangelicalism, I expected Muslims, who also hold a very high view of their scriptures, to carry their own. I am not sure if they merely trust the local Imam to interpret the scriptures for them, as in many Catholic churches, or if it is considered improper to bring a Quran or printed book to prayers. A couple of English-speaking members looked at my translation, and did not recognize the author, but did not seem upset at my bringing a Quran or the particular translation. During the service, an older man sitting next to me in the back motioned to me to see the book. He opened up the front, a page in the middle, and in the back, then kissed the front cover and handed it back to me without saying a word. Although many of the younger attendees wore jeans, I felt like I stood out with my white and muted red plaid shirt, since most of the men present wore a dark or earth colored shirt. I’m not sure if that was merely a cultural thing, or if, again, I was missing some social taboo for visiting the mosque. The 30 minute lecture began 15 minutes early, and so ran for 45 minutes. Prayer began after the lecture. I was first surprised that the lecture began early rather than as scheduled, and due to this early start, it seemed that many men wandered in late, and what I suspect were the more senior members walked up to find seats on the carpet far up front. However, this wandering in (and out) continued not only during the lecture, but to some extent, even during the prayers. They would bow halfway, sometimes putting their hands on their knees, then stand. Again, this seems very similar to the more ritualized versions of Judaism and Christianity, especially Catholicism, but in Evangelical circles, such things might seem strange or even religious superstition. While I should not have been too surprised, twice during the service, an older man went up to the front, set his back to the audience (facing Mecca), and chanted in a stereotypical nasal song â€œAllahu Akbar,â€ stretching out the vowels in the first word as he let his voice ascend and descend along a middle-eastern type of scale. During the end of the service, ushers actually pushed people forward to fill in the gaps so that last moment attendees had room, and they too joined in the last moments of prayer. I noticed later that at one point in the prayer the attendees looked slowly right, then left. I later learned that, as part of the ritual prayer (Salaat), Muslims believe that an angel on your right side is recording your good deeds, while the one on your left is recording your bad deeds. In this way, you are sending peace to those angels. To me, this reinforces both the heavy emphasis on angels in Islam, as well as their works-oriented soteriology. Two younger men approached me after the service. One was very friendly, and recognized me as a newcomer, and welcomed me. He was interested in why I was there, and told me briefly that he had left Islam for a while, but returned to it. He also informed me that this was not his normal Mosque, and that this was a very â€˜culturalized’ experience, meaning it was in some ways very Afghani. I wondered how much different other Mosques might be. He first presented the idea that â€œnothing is for free, so therefore the gospel is illogical.â€ He had a real concern that a religious system without required works would lead to freeloaders, hypocrites, and a non-demanding faith which he rightly perceived as a deception. I did explain that in the Christian view, works are not required, but real faith led to works. He was not quite convinced, but I also shared Ephesians 2:8-9, which is a short explanation of why works are excluded, and why the most mean person may take advantage of God’s kindness even if an immeasurable weight of sin were behind him. His second a main objection to the gospel was that God could not justly punish an innocent man for another, even if the second man willingly gave himself. I am surprised that this objection even arises within Christianity as an ethical impossibility, where I see such a gesture as extravagant love. While even my new friend agreed with the phrase â€œThere is no greater love than to lay down one’s life for one’s friend,â€ somehow he could not connect that to the gospel and penal substitution. I briefly encountered this idea in Braswell’s book , and always find it curious that many don’t find the same kind of logic in Christianity. However, I think there may be a few reasons why Islam appears as â€˜more logical’ than Christianity on the surface. So don’t let anyone condemn you for what you eat or drink, or for not celebrating certain holy days or new moon ceremonies or Sabbaths. For these rules are only shadows of the reality yet to come. And Christ himself is that reality. Don’t let anyone condemn you by insisting on pious self-denial or the worship of angels,[e]saying they have had visions about these things. Their sinful minds have made them proud, and they are not connected to Christ, the head of the body. For he holds the whole body together with its joints and ligaments, and it grows as God nourishes it. While Christian teachings on faith and politics have a rich and successful history, not least of which is arguably modeled in the American Experiment, Christianity is somewhat open-ended, if not equivocal on faith and politics. There is not one official view, though many Christians share the general idea of separation of Church and state powers. This open-ended view is not as clear as the theocratic rules set down in Islam. For this reason, many Muslims consider Islam to be a better overarching, integrated system for all of life. To some extent, you could say that the majority opinion in Islam is clearly Dominionist, while in Christendom, such practitioners are a vast minority , f for no other reason than the fact that theocracy it is NOT required or explicit in the New Testament. My new friend and I exchanged emails, and we may continue to correspond. I am fascinated that a Pentecostal Christian would convert to Islam, and suspect something more is going on. Perhaps he witnessed too many hypocrites, or bad doctrine, or emotionalism that made him think that the more serious demands of Islam were better suited to him. I told him I respected him for taking a hard and honest journey, and as a fellow traveler, blessed him. But I was disinclined to surrender the beautiful gospel of grace for the â€˜logic’ of Islam.